He was back! Before an ecstatic crowd of 15,000 people at the Chicago Coliseum, Col. Theodore Roosevelt declared himself a candidate for President of the United States — 100 years ago today. The occasion was the first convention of the Progressive Party. Roosevelt had served two terms as president, then engineered the election of his friend William Howard Taft in 1908. 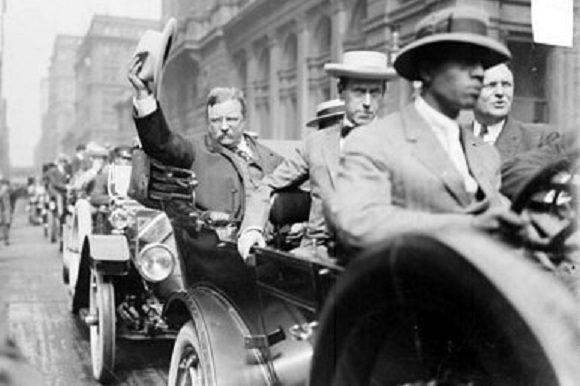 By 1912 the two men had broken over policy matters, and Roosevelt had challenged Taft in the Republican primaries. The crowd at the Coliseum knew the rest of the story too well. Roosevelt had won most of the primaries, but the Republican bosses had still nominated Taft. The people had been ignored. So when Roosevelt announced he was quitting the Republicans, he took much of the party with him. The audience yelled themselves hoarse. They remembered the golden years of the Roosevelt administration. He had broken up monopolies, settled strikes, built the Panama Canal, started the National Park system, and won a Nobel Peace Prize for ending the war between Russia and Japan. He’d been the most popular president since George Washington. Roosevelt spoke for nearly an hour, but the people in the Coliseum didn’t notice the time pass. Nothing else mattered when the Colonel was talking. At the end he brought them to their feet, comparing the current fight to the Bible’s final war of good against evil: "We stand at Armageddon, and we battle for the Lord!" Afterward someone asked Roosevelt about his health. “I feel as fit as a bull moose,” he declared. 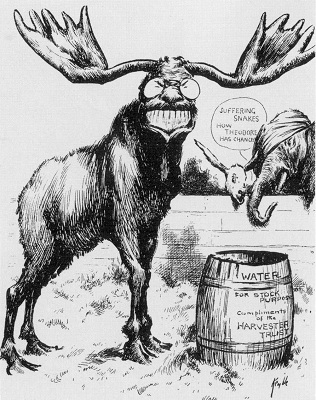 From that time on, the new party was nicknamed the Bull Moose Party. In November Roosevelt and the Progressives pulled more votes than Taft. But the split in the Republican ranks sent Democrat Woodrow Wilson to the White House. The Progressive Party eventually fell apart, and Roosevelt rejoined the Republicans. He died suddenly in 1919. At the time of his death, he was the odds-on favorite to win the Republican nomination for 1920.